Toyota doesn't stop with the Mirai in the hydrogen fuel cell car developments. The automaker is introducing the Lexus concept and another Toyota concept called the FCV Plus. This one looks to the future, in which cars will become something entirely different than what we're used to today. FCV Plus is AWD, with in-wheel motors, powered from a fuel cell stack. One of the new features is capability to export electricity. 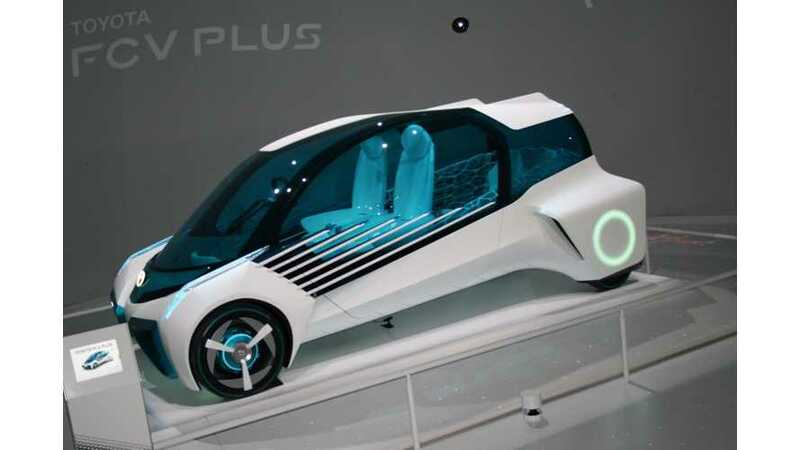 "The FCV Plus Concept -presented at the 2015 Tokyo Motor Show-takes the idea of hydrogen one step further. Not only does it provide 0-emission driving, it is also conceived to work as a miniature power-plant that can give energy back to society. The FCV Plus concept embodies our plans for an eco-friendly future where hydrogen energy is widespread in its use: the fuel cell vehicle isn’t only a means of transport; it is also a tool to turn hydrogen into electricity so that it becomes a power source for general use in the community."